The Traveler Trail Run celebrates the end of summer on Hood Canal and supports the Olympic National Park. The race will be hosted along the trails of Skokomish Park Lake Cushman - 7211 N Lake Cushman Rd, Hoodsport, WA 98548. The recreational area is bordered by the Olympic Mountain range and covers over 500 acres with three boat-launch ramps on the 41,500 feet of freshwater shoreline on Lake Cushman providing a unique opportunity to promote local Hood Canal business/organizations and Pacific Northwest recreation. Packet Pick-up will be available on Friday September 28, 2018 between 5pm-7pm at The Hardware Distillery, 24210 US Hwy 101, Hoodsport, WA. 98548. Beat the rush, grab race details and a bite & taste some amazing local spirits while socializing with other participants. If you are unable to attend the early packet pick-up, packet pick-up will be available on race day Saturday, September 29, 2018 between 8:30am-9:30am. All registered participants will receive race bib, timing chip and swag bag with goodies from our event sponsors, locally prepared bite and cold beer or n/a beverage at the finish line for participants. With registration a 5% donation will be contributed to the National Parks Foundation supporting the Olympic National Park. Event t-shirts will be available for registered participants for an addition $15 and must be pre-ordered with registration to guarantee availability and size. *What is it like to #BeTheTraveler on The Traveler Trail Run? You embrace a healthy lifestyle choice and the very best in local art, food, recreation, events and the undeniable beauty of the Pacific Northwest. The 5-mile course offers something for travelers from all walks of life. The race will be professionally timed by Eclectic Edge Racing – the competitive runners will set up 1st at the starting line for our first wave at 10am. The second wave will start at 10:20am for team and walking participants. Eclectic Edge Racing will provide online results and 1st, 2nd and 3rd place finishers for all designated age brackets and Hood Canal Events will be providing prizes for top finishers, best individual/team and craziest costume themes. Lodging and accommodations are available! Receive a discounted event rate at Skokomish Park at Lake Cushman - offering 34 RV sites and 60 campsites for travelers coming to the area for the Traveler Trail Run event and there are hotel and cabins available at both Glen Ayr Resort, glenayr.com and the cabins located at Waterfront at Potlatch Resort, www.wfresort.com as well as numerous VRBO’s in the area. Event t-shirts will be available for registered participants for an addition $15 and must be ordered with registration to guarantee availability and size. Day of t-shirt sales will be available while supplies last. EARLY REGISTRATION STRONGLY ENCOURAGED Day of registration will be limited between the hours of 8:30am and 9:30am on 9/29/18! 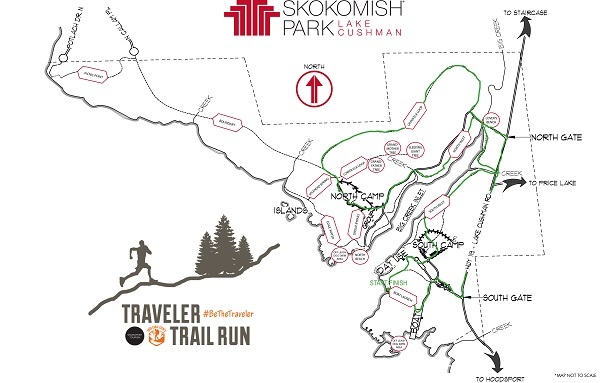 The course meanders through well cared for trails along Lake Cushman (see route map). Participants enjoy a gentle terrain with a few rolling hills over the 5-mile course. After you check in, we invite you to take part in a light cardiovascular warm up and stretching to get your body ready to perform its best. Once the race begins you’ll enjoy spectacular views, 2 hosted water/aid stations sponsored by local area business and support from the cheers of staff and the participant friends and family that are invited to gather along the trail. When this page loaded, the official time was 12:42:07 PM EDT.